From loose legs, broken backs, failing veneer or a complete breakdown, our team can repair it all! We expertly piece together and rebuild broken and damaged items to "like new" original condition. Everything is done by hand to ensure the correct fit the first time, every time. Repair charges start at $75 per piece. Have a tired, worn finish? Let us restore it to "like new" condition! All of our refinishing work is done by hand, the old fashioned way. We never "dip strip" any piece as this technique has been proven to loosen the glue joints of the piece to where it may fall apart in as little as six months. Therefore, each piece is carefully hand sanded and inspected under intense light to ensure quality before it is finished per the customer's choice. All stain is water based in nature with no VOC's! All stained refinished items have 4 to 5 coats of a durable hand brushed polyurethane in a sheen appropriate to the piece to give the ultimate in protection and durability. We finish with a hand sanding and wax polish. All painted finishes are just as durable because we start with top of the line Behr Marquee paint. We start the paint job the same as a stain job with bare wood. We then apply a coat of primer followed by 4 to 5 coats paint color. We finish with a hand sanding and wax polish. 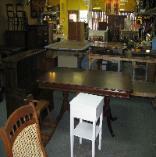 Refinished or painted pieces vary in price based on size and any necessary repairs needed. 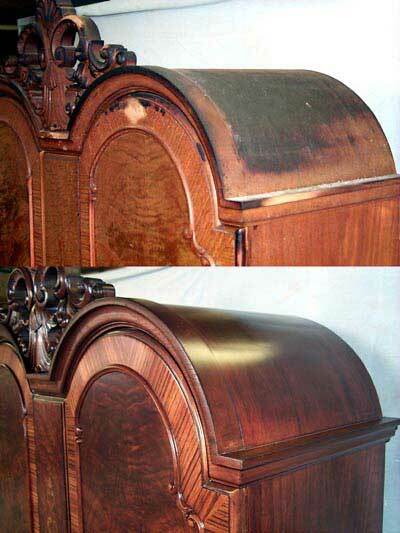 The average restoration cost is typically less than 1/2 the cost of buying a new piece of furniture. When a complete refinish is not warranted on a cherished family piece, allow us to lovingly restore the shine and luster without fear of damage to the original patina! 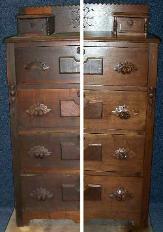 Many old pieces simply loose their appeal over the years due to wax and dirt buildup. A simple, non-abrasive cleaning will restore the piece to it's original character that can be shown off for years to come. Conservation work starts at $125 per peice. Worn or scratched finish on your gun stock? Let our expert team restore it to like new. All gun stock work is done by hand with extra care and attention to detail. Grip or stock refinishing starts at $25. Nothing devastates valuable possessions of the home like a fire or flood. Our team may be able to restore those valuable family or otherwise irreplaceable pieces of wood furniture and antiques that are a part of your life. We can replace damaged or missing parts, reassemble items that may have separated, repair furniture that may have come unglued due to heat or water, refinish heat damaged wood furnishings, and completely restore many of your damaged items to like new condition. We take great pride in our work, especially when we help you recover from a disaster like a flood or fire. Prices are according to the type of damage. I f your glass or mirror, beveled or smooth edge, is damaged or broken we can replace it using the correct type of glass or mirror. We can also restore the frame, whether it be antique or modern, making sure to match the color, style and finish. The appearance of the piece should not be different after the repair, and we take the time to keep the look of the wood as it was originally designed and manufactured. Curved glass is another one of our specialty areas. 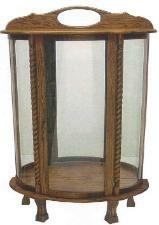 Many types of display cases, china cabinets, hutches, and other furniture have curved or bent glass panels. We can replace most of these panels with new pieces. Please understand curved glass is made to order and therefore turn around time can be as much as 8 to 12 weeks on the glass once it has been ordered. Curved glass prices start at $300 per panel. 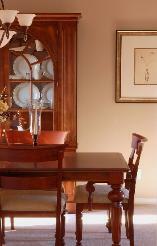 We are happy to provide you with insurance estimates for furniture repair or refinishing. We can come to your home or office or you may bring the damaged item to our repair shop. We will give you a written insurance estimate and expected time needed to repair the item. We can also handle providing the written quote as well as pictures to your insurance company if needed. A fee of $100 is charged for the insurance estimate and will be credited to your bill when we perform the insurance repairs.